In March 2011, peaceful protests broke out in Syria in response to the regime’s torture of high school students who sprayed anti-Assad graffiti on walls. At this point, aided by coverage of the cause by “trusty” media outlets, many of us were ready to believe that the wave of the Arab Spring had now reached Syria. We rode this wave and sided with the Syrian people in their revolution, uniting under the common cause that the ruthless dictator, President Bashar al-Assad, had to go. Seventeen months on, the Syrian revolution has turned sour, and media outlets have also become complicit in distorting the truth and are lacking in objectivity. The only universal truth is that thousands of lives have been lost unnecessarily, and that this figure continues to climb every day. What started off as a peaceful people’s uprising for democracy quickly morphed into an armed rebel movement versus the regime, as Assad’s forces used violent measures to quash the protests. Oddly enough, the “democratic” Western world cheered the armed opposition on as clashes between rebel groups and government forces escalated into bloody, full-scale battles between the Free Syrian Army and regime forces. While the repetitive vetoes by Russia and China at the UN Security Council have prevented the US and its cohort of allies from employing direct military intervention in Syria, they have demonstrated a skilled prowess in the field of indirect military participation. According to media reports, the Western-backed Free Syrian Army (FSA) now receives logistical support from Britain, on the ground military training in Syria from British and French specialists, and from American and Turkish army personnel at the US military base in the southern coastal province of Adana in Turkey. Bizarrely, former civilians-turned-rebels on the ground in Hatay repeatedly lament the lack of support in terms of weaponry and funding from the West. To justify their place on the bandwagon of revolution, countries such as the US have spouted well-known cliches that they are there to secure democracy and freedom for the Syrian people. However, after our experiences with “Operation Iraqi Freedom” we know all too well that America whips out its democracy card to conceal its vested interest of securing control of oil reserves. For aren’t countries such as Saudi Arabia and Qatar just as, if not more, autocratic than Assad’s regime? A frequently asked question is why the US doesn’t act as the harbinger of democracy for the Gulf states? So it seems once again, that despite the US administration’s cries of democracy and lamentations for dying Syrian civilians and human rights violations, people in the oil-rich Middle East still feature as disposable pawns in this US administration-manipulated plot for greater regional control. The Greater Middle Eastern Partnership Initiative, drawn up shortly after the war in Iraq, is just such a project which demonstrates to what extent the US call for democracy is suspect. Known initially as the Greater Middle Eastern Initiative, the project viewed the promotion of democracy and socio-economic development in the Middle East as one of the main ways of combating the “terrorism” threat posed by Arab countries after 9/11. However, let’s not forget that it was actually adapted from the 1975 Helsinki pact – intended to promote greater freedom and human rights in the Soviet Union and eastern Europe. This readiness to assess the Middle East – a region with different cultural values, economic and political systems to the Soviet Union in Cold War terms, is revelatory of the US administration’s genuine lack of planning and shallow understanding of the region. US insincerity was also exposed when they failed to consult the 22 countries that were involved in the Initiative. Much to their outrage, the plan was leaked to the media and prompted a torrent of angry critique, with Egyptian chief editor of the Arab Human Development Report, Nader Fergany referring to the “the arrogant mentality of the current (Bush) US administration in respect to the rest of the world” in an article published in al-Hayat in February 2004. People in the oil-rich Middle East still feature as disposable pawns in this US administration-manipulated plot for greater regional control. As a result of the general Arab furor on not being consulted and left in the dark about plans for their own countries, the Bush administration hastily renamed the project the Greater Middle East “Partnership” Initiative – in order to justify that it was a two-way project – and set about persuading disgruntled Arab states of the Initiative’s benefits by recruiting Turkey as their side-kick and proxy. 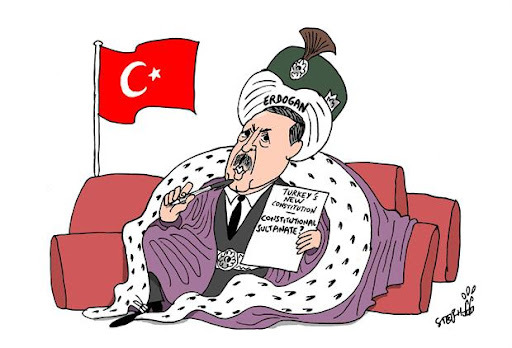 As a country which promoted the idea of “conservative democracy” under the umbrella of the Justice and Development Party (AKP) led by PM Recep Tayyip Erdogan, Turkey appealed to Western countries through its image as a democratic reformer and to Arab countries through its sustaining of a traditional Islamic identity. A perfect choice for the US administration which didn’t want to be seen as barging into the Middle East alone, considering the environment of heightened anti-American sentiment after Iraq. Why not pep-talk Turkey into thinking that it could be a global power and get it to do the dirty work? In any case, Turkey’s leading role, on behalf of the US in the Initiative, is running into a series of obstacles. Turkey’s “zero problems” foreign policy, as orchestrated by Foreign Minister Ahmet Davutoglu, was based on the idea that the country would sustain peaceful and stable relations with its neighbors. Ironically, Turkey’s ties with Israel have been frozen ever since the Gaza flotilla raid in May 2010, and Turkey’s political and military support for the Syrian opposition has broken diplomatic relations with both Damascus and Tehran. Before the Syrian unrest, trade relations between Syria and Turkey peaked at over $3 billion, but has since dwindled. Turkey’s pro-rebel support and refusal to help free 48 Iranians captured by rebels in Damascus has also drawn heavy criticism from Iran, which backs Assad’s regime. Earlier this month saw diplomatic relations hit rock-bottom when Iran suspended visa privileges for Turkish citizens. Added to worsening ties with its neighbors, Turkey now faces the growing threat of Kurdish rebels. The emerging independence of Syrian Kurds has meant that Turkey now faces a Kurdistan Workers’ Party (PKK) threat that stretches its Iraqi and Syrian frontiers. As it stands, Turkey’s role as regional mediator in the Initiative has not attained its hubristic goals of Ottoman revival and global power. For the moment, Syria’s civil war shows little sign of waning. With once glorified rebels also shown to be guilty of committing human rights atrocities, calls for a general rethink have surfaced. Are we ready to believe that freedom and democracy for the Syrian people can be built on the foundations of extreme violence? Or is a continuation of the violence in the form of a sectarian showdown in the forecast, when and if Assad goes? The fact that Assad has been able to cling onto power for the last 17 months may indicate that he actually has considerable domestic support, or that certain opposition figures have withdrawn their support for the violent means used by rebels to secure democracy. 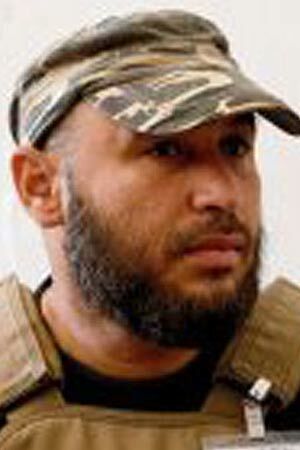 It could also mean that the rebels are not receiving as much weaponry and monetary support as they would like. In any case, the FSA is not all that it seems. It lacks a strong central nerve center and is divided ideological and ethnically. Experienced Libyan fighters who helped topple Gaddafi along with Bosnians, Chechens and the odd Turk, Jordanian and Egyptian, according to a local doctor in Antakya, have also joined the ranks of the FSA and undermined the distinctly Syrian nature of the uprising. What’s more, the presence of al-Qaeda and jihadist rebel units among the FSA have ironically confronted the US with a terrorist threat problem that they were supposedly trying to clear by meddling with Syria in the first place. A revolution is better achieved by the people of a given country who want change. They should be the key players who call the shots and decide what’s best for their country. But throughout this 17-month long conflict, the increasingly prominent role played by Western nations and their allies have changed the face of the Syrian peoples’ revolution into that of a Western-led revolt. The US and their allies conveniently sidestepped the UN Security Council stalemate by fueling the armed opposition with logistics, training and weaponry. President Obama’s recent announcement – now backed by Britain – that Syria’s chemical and biological weapons constitute a “red-line,” which would invite military intervention if used against rebels, implies that it is wishful to think the US will keep out of Syrian affairs. Curiously, Obama’s speech echoes President Bush’s reference of past years to the threat posed by Saddam Hussein’s non-existing WMDs, which he used as a pretext to invade Iraq. The presence of al-Qaeda and jihadist rebel units among the FSA have ironically confronted the US with a terrorist threat problem that they were supposedly trying to clear by meddling with Syria in the first place. Even if the Syrian opposition wishes to determine the fate of their own revolution, it may be the case that their struggle is caught in a wider geo-political dispute between the US and its allies on one front, and Russia, China and Iran on the other. While the FSA’s military council calls for a unified Syria post-Assad, the conflicting desires amidst the fragmented units within the group, along with the lack of agreement at the heart of their political wing – the Syrian National Council – have undermined the unity of the Syrian Revolution. Such lack of unity and political infighting has added to the increasingly sectarian hue of the civil war and led to indications that Syria may divide into a mini-states if Assad goes. 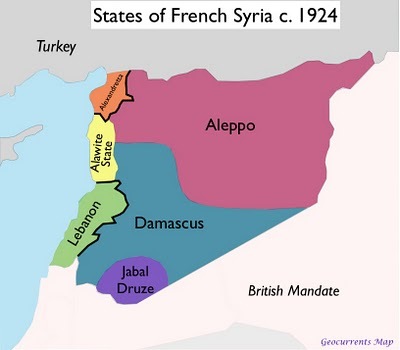 But a divided and weakened Syria plays into the US advantage by leaving the path to Iran clear, and strengthens Israeli security in the region by destroying the “axis of resistance” embodied by Syria, Iran and Hezbollah. Aside from their humanitarian concerns, Russia, China and Iran are all too aware of the downsides of a fragmented Syria. With Syria weakened, and a new pro-US government reinstated in Syria, Russia and China will lose their ties with a country that opened up their access to Mediterranean maritime trade routes. American and Israeli desires will also converge and focus on dismantling the regime in Iran. Aware of these dangers, Syria’s backers continue to thwart the idea of outside interventions, and state clearly that Syria’s fate must be decided by her own people. Ultimately, when the last scene unfolds in Syria and Assad is disposed of, the question of whether or not people think the revolution has been achieved will be of little importance for the US administration. Washington will have achieved its goal of dismembering and weakening Syria, in the process providing greater regional positioning for its local ally Israel. But long after every US ally has claimed a share of the spoils, the memory of the bloodshed and thousands of lives lost unnecessarily will remain with the Syrian people. Emiko Jozuka is a Japanese freelance multimedia journalist currently based in Antakya.